Our Training Program consists of 42 Chapters of instructional and understandable information. Each chapter includes photo illustrations with hands on step-by-step procedures and confidential information. The only automotive locksmithing program in existence. This program is used by locksmith, automotive dealers, fleet managers, & auto auctions. The most complete automotive locksmith training program available. 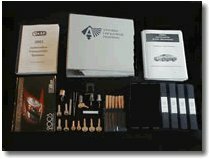 The most complete automotive locksmith training program ever assembled!!! Learn to Re-key Locks from Professional Locksmith.